The Croydon Sports Injury Clinic team co-manage chiropractic, osteopathy, physiotherapy and sports massage treatments for excellent results. Many patients including athletes, sports teams and persons from the local community have achieved exceptional levels of health through our sports-specific and injury rehabilitation programs. Our experienced health team manage patients with a wide variety of conditions and sports injuries. The secret to our success and our attainment of trust has been gained from providing the best possible treatments for back pain, neck pain and sports injuries, using up-to date rehabilitation programs and evidence based medicine. International Chiropractor Dr Roddy Knight provides chiropractic evaluation for many conditions including back pain, neck pain, headaches, sports injuries and shoulder pain. If you are new to Chiropractic and/or wanting to find out more about our Croydon Sports Injury Clinic services – look no further! Our website is a great place to explore and when your ready, you can call us or email and we will be pleased to answer any questions. Lots of information about Dr Roddy Knight (Chiropractor) and his sports injury teams can be found on the physiotherapy, osteopathy, massage and sports injury parts of the website. 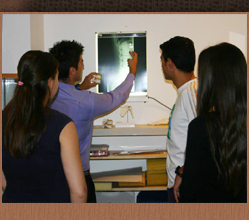 Discover what a chiropractor is, what chiropractors do and what you can expect from your first appointment. We are sure you will be encouraged by our high standing as a centre of excellence in patient care. 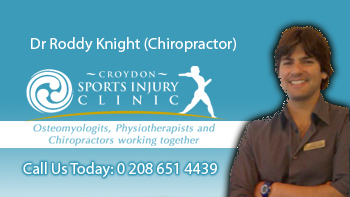 Looking for an After Hours Croydon Chiropractor? Contact our emergency after hours chiropractic service if you need a same day Croydon chiropractor and have back pain, neck pain, tension headaches or sports injuries. If you need a Croydon chiropractor, physiotherapist in Croydon, osteopath or sports massage then we are here and ready to help evaluate your symptoms and provide a diagnosis of your condition. Our International sports injury clinic provides additional after hours chiropractor and emergency chiropractor service for Croydon, South London, Greater London. During normal operating hours our sports injury team including Osteopaths, physiotherapists and massage therapists are available for assessment on 0 208 651 4439, 9am to 7pm Monday through Friday and Saturday 9am to 12pm. The Croydon Sports Injury Clinic team of health professionals also provide private referral for MRI, CT scans and X-rays for further investigation of painful conditions. In addition to great customer service, Croydon Sports Injury Clinic gives helpful advice and demonstrations for back braces, knee braces, memory foam pillows including Complete Sleeper memory foam adjustable pillows. If after a full assessment we believe you are a suitable candidate for our professional care then we may also provide same day treatment. Our Croydon and Selsdon chiropractors, physiotherapists and osteopaths at Croydon Sports Injury Clinic will try their best to help with your condition. For a list of definitions of some conditions commonly used by patients follow our back pain Clinic drop down menus and back pain chiropractor section. We hope to see you soon – come and benefit from all of our services including chiropractic, physiotherapy, osteopathy and sports massage. Our Croydon-based clinic is proud to serve the communities of Greater London and Croydon including the local suburbs of Selsdon, Sanderstead, Warlingham, Limpsfield, Westerham, Redhill, Purley, Kenley and Bromley.